With the new Dala Ceramics @ Home Artliners it is easy to create a gorgeous olive oil bottle, guaranteed to add a classy touch to your kitchen or a sunflower oil bottle that will brighten up any room. 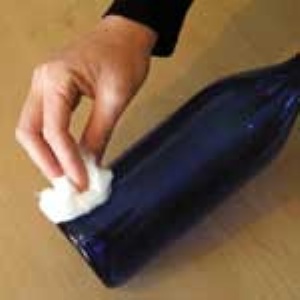 Clean the bottles with cotton wool, dampened with the water and vinegar solution to clean off grease marks and dirt. Using Silver Dala Ceramics @ Home Artliner, write the words “Olive Oil” in the middle of the bottle. Decorate around the top and bottom of the bottle with Silver and Copper Dala Ceramics @ Home Artliners to finish off the bottle. Bake for 40 minutes at 150˚C. Stick glass beads at the bottom of the bottle with contact adhesive glue. Use a new cork, available from craft shops. Stick glass bead on top of the cork with contact adhesive glue. 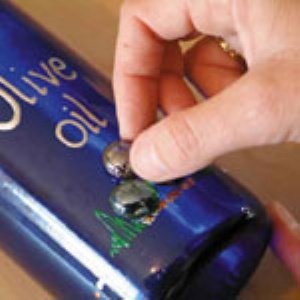 Pour Olive Oil into the bottle, put the cork in and stand the bottle next to your stove in the kitchen. Using Green Dala Ceramics @ Home Artliner, draw a stalk with leaves. Once this is dry, enhance the stalk and leaves with Green Glitter Dala Ceramics @ Home Artliner. 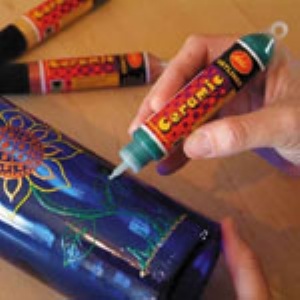 Draw grass and sand at the bottom of the bottle with Gold Glitter and Green Glitter Dala Ceramics @ Home Artliners. Decorate the top of the bottle with leaves to finish off the bottle, using Green and Green Glitter Dala Ceramics @ Home Artliners. 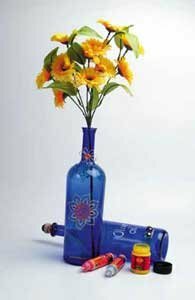 Use long-nosed pliers to manipulate soldering wire into the shape of a flower and attach to the neck of the sunflower bottle. Stick an orange glass bead in the centre of the wire flower Place real or artificial sunflowers in the bottle. When using Dala Ceramics @ Home Artliners, maintain a constant pressure to ensure an even line. Hold the applicator at a 45˚ angle so that you can see the nozzle at all times. It is recommended to draw away from your body instead of towards your body for better control of the applicator. Mistakes are easily removed with an ear bud. The Dala Ceramics @ Home Artliner range is available nationwide from al major arts, craft and stationery stores. For more information, please phone the Dala helpline on 021 557 8003. This item has 873 views.